360 Sports Lounge is a nice spot that features the right combination of comfortable seating, TVs galore, great food, and a selection of beverages. It's a casual but classy hangout in the middle of Washington Avenue. The staff is very friendly and are constantly attending to your needs, which is better than a lot of other places. This sports lounge is the perfect spot to watch any big sporting event. You can sit anywhere in this place and see a TV. They have 3 huge projection TVs on the wall behind the bar and then smaller flat screen TVs all around the rest of the place. 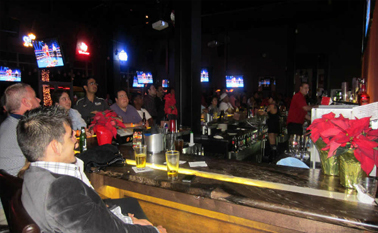 Great atmosphere, good food, and amazing flat screen televisions to watch whatever game is on.